My friend Goggla asked me in an email if Peoria had many bowling alleys and I checked online and there’s lots of them in and around town. As a young juvenile delinquent, I used to hang out at Bowl-Mor, play pinball and smoke cigarettes. But Bowl-Mor is gone (except for a chunk of it in Phil Luciano’s garage), pinball machines aren’t as plentiful and I quit smoking three months ago. Well, I thought it might be fun to check a couple of bowling alleys still in existence every month till we’ve hit every bowling alley in and near Peoria. 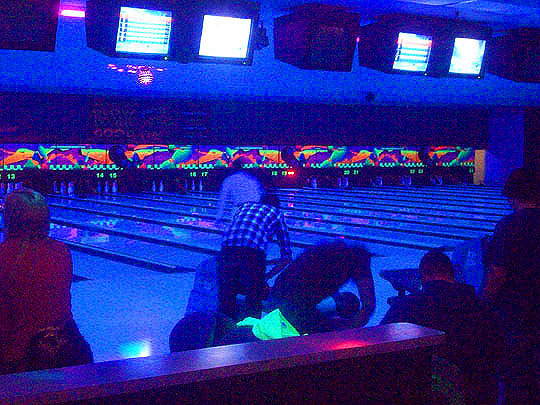 The first one we’ll go to is a bowling nearby where I’m living, the Mt. 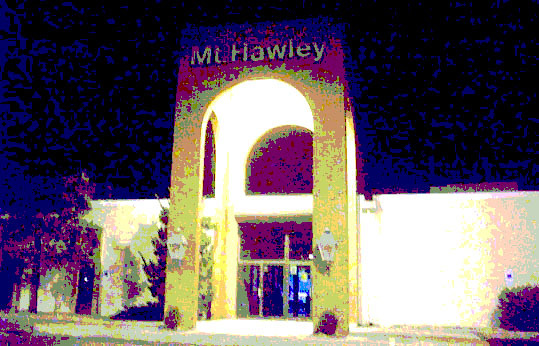 Hawley Bowling Alley. Let’s roll! Wow, a pretty impressive building! Let's go in and see what's shaking in here. 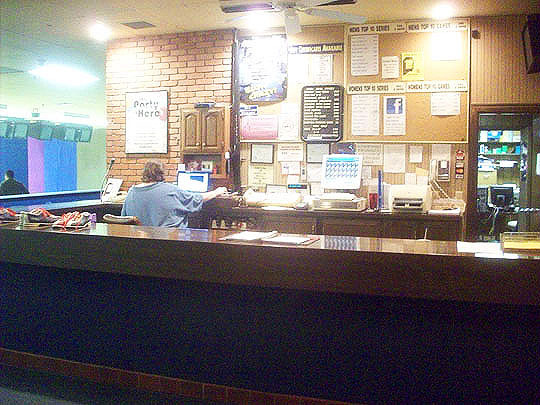 Here's the front desk and you know when you approach a front desk at a bowling alley that bowling shoes are close at hand. Baboom, the eagle has landed! 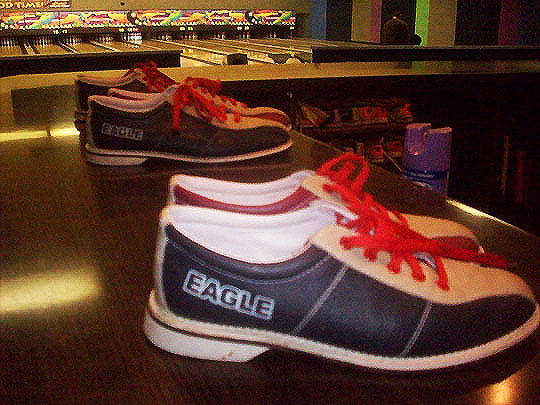 Here's the lanes, not too busy in here tonight. 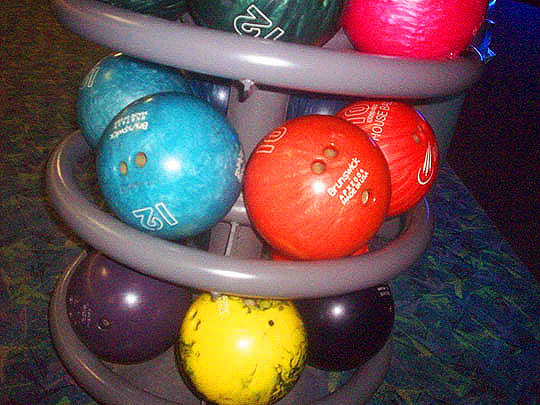 Colorful bowling balls are lined up in this rack. The loneliest bowler in the world goes for a spare. I was hoping to find a bar in here soon, but this isn't quite what I had in mind. They do get points for having Butch's Pizza. I'd order one, but I had dinner already and I'm more thirsty than hungry. There's got to be a bar around here somewhere. Okay, now it's starting to fill up a little bit in here. Holy shitballs, check it out, the lights just went off and the whole place has turned into a black light poster! Music is playing over the speakers and people are getting into a festive mood. Personally, I just want to find the goddamned bar! 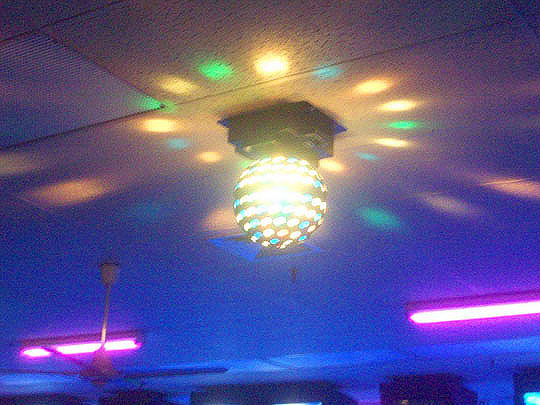 Spinning disco lights complete the party mood in here. I've really worked up a powerful thirst after taking all these photos! Unlike Bono, I finally found what I'm looking for! 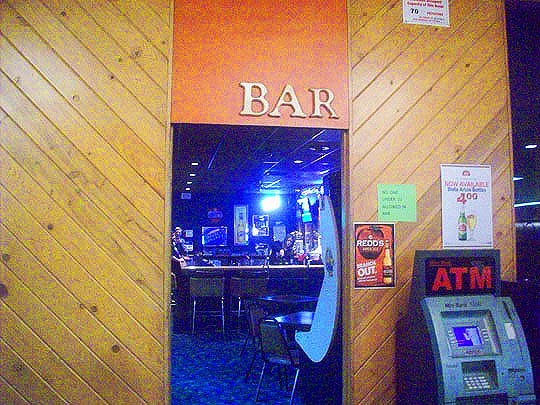 The bar! Everybody else is enjoying the moonlight bowl, so there's plenty of seats at the bar, perfect! Sam the bartender cheerfully serves up a much-needed beer. Hmm, I wonder if she's any relation to Sam the Butcher? Here's the view from my perch at the bar. The place has a combination tiki bar/ski lodge feel to it. Now for the patent-pending taps shot for Spike. Just two drafts to choose from, but I love the bowling pin taps, nice touch! 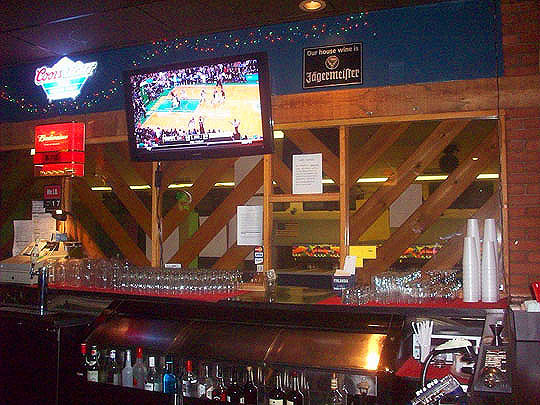 There's tables and a shuffleboard table behind the bar. 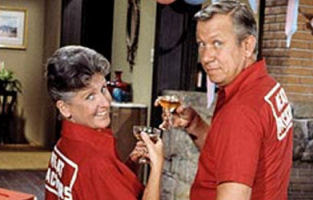 This couple took a break in their shuffleboard activity to pose for the MBIP camera. 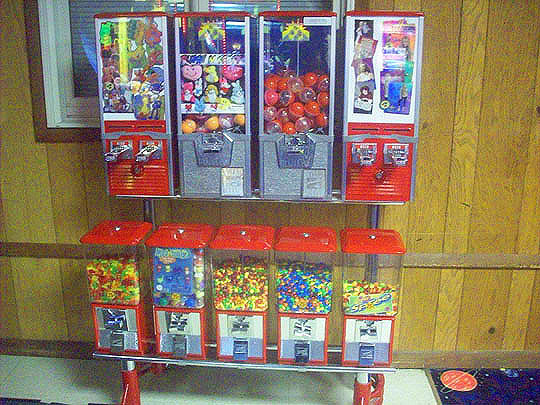 And there's video poker machines near the front door. These are something else that I've never seen in New York and while I'm not a gambler, I'll have to try my hand at them one of these nights. My pal, Biff would love this Miller Lite clock, but sadly she has an old operating system and can't view this blog for technical reasons. Sob! Okay, I gotta go, these pretzels are making me thirsty! See yez, tomorrow! Further reading: Peoria Night Out, Insider Pages and facecrack. An' they are all that I can see. My teenage years were wasted all on me.